You've started playing Clash of Clans, or maybe you've "inherited" a game from another player. The game is rushed - crazy rushed even. It's TH11 and still has TH3 level structures, or maybe it was a skinny-game used in war that doesn't even have most defenses down. How on earth do you recover from such a game? This game is my KussVonNacht game it was a mess. But man oh man did I ever have fun recovering it. You're probably asking how such an exercise could possibly be fun or even be done in the first place. After all, we're talking a jump of essentially 5 levels, skipping TH7, TH8, TH9, and TH10 entirely. SO! It's been about a week and a half since our last progress check and things are coming along quite nicely on all of the games. The base I'm currently using is yet another diamond variant. It's based on one that's popular in the top 200 but with the usual tweaks and such. I've been seeing a lot more Mass Night Witch attacks, so I made sure to cover that from most angles as well. I typically get around 3 wins out of 5 with this base so I can't complain. So...you've been playing the new Builder's Base a while and you've hit a serious rut. All you see is one BH level above your own, even though you're barely mid-way through the BH level. Is it time to upgrade? Should you max everything...some things...nothing? Unlike the main game of CoC, the BB does not really penalize rapid advancement. In fact, if you wait too long to upgrade, you'll probably drop in trophies and suffer the slings and arrows of your opponents (sometimes literally!). The real question, though is WHEN should you upgrade? Ok - so, time for a little hard love. When the Builder's Base (BB) first came out, I was NOT a fan. I truly hated the idea that I was being pushed into what amounted to a new game when the original game still had so many problems. I've softened my stance a bit over the last month; although I STILL want to see the main game fixed, I'm seeing potential for this new game as well. That's not to say there aren't issues; there definitely are problems. 1) Slow as molasses - The loot cap is ridiculous. I get what SuperCell (SC) is trying to do with it, slowing down progression and getting people to spend gems, but I'm accustomed to the open throttle of the main game and the BB takes forever. The first three BH levels are no biggie, and I can even suffer through the slow pace of BH4 but taking more than a single day just to get enough resources to do an upgrade...especially when that upgrade itself will ALSO be 2-3 days? That's just the pits. NOW - on to the update. It's been a busy week or so. 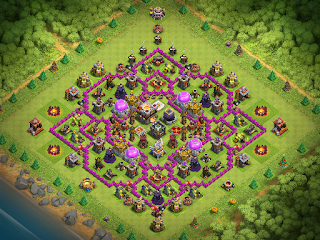 ClashManiac is BH4 and continues to upgrade like mad. 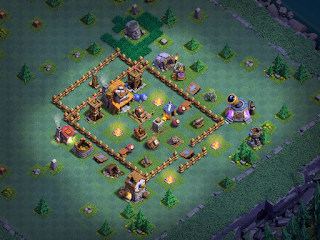 Having had a chance to play the game since day one, and playing seven different games, I've come up with what I think will be my go-to rushing strategy for the Builder's Base (BB) and I've already been using it across all seven active games. Noctaire - This is my main game, running a rushed BH5 at 3006 trophies. It was the first one that I launched, so it's the furthest along. This game is running a variant of the ever present, diamond shaped design that is probably the most popular base in the game today. I expect to take it to BH6 in another week or two. BTW - this base can be beaten by using the Bomber to bust the walls along one side, Beta Minions/Archers/Barbarians to clear junk buildings around the perimeter, then Giants and/or Battle Machine to take out the core. There are a few videos on YouTube where they show how to do it but it's definitely a ground attack you'll want to use on this one; air attacks only work when someone exposes the air defenses to the outer perimeter. This weekend, I posted links and information on the 7 games where I'm currently playing the Builder Base, including how to see them online. I also posted an article with the most recent base designs I have up - 3 BH5, 3 BH4, and 2 BH3. Noctaire - TH10, my main game. Builder's Base rushed to BH5. ClashManiac - Strategically rushed TH9; source for most of the content on the "Journal of a Rusher" series. Builder's Base rushed to BH4. 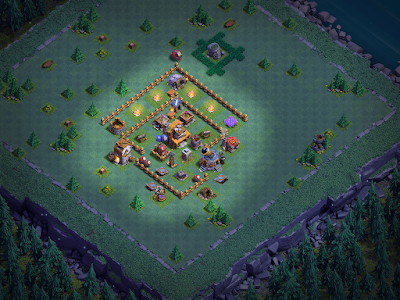 NachtHerr - Strategically rushed TH9 that is currently working on heroes and getting walls to level 9. Builder's Base rushed to BH5. ZedVerteidigung - Rushed TH9 that was originally intended to be a defenseless...right up until I accidentally dropped an Archer Tower. Builder's Base maxing each level, currently finishing up BH3. Psyberon - Stratgeically rushed TH9. Builder's Base maxing BH4; currently working on walls, Bombers, and Gem Mine. 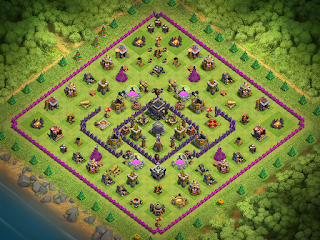 Anyone who has played BH5 in the 2400 trophy range has seen a base that is heavily used. it's in the shape of a diamond and, when properly deployed, does quite a number against Baby Dragon or Beta Minion attacks. I created a version of this of my own that I'm currently using on my own BH5 games. The original design of this base - at least the one I see floating about the most - has the Air Bombs in the lower apex of the base. The problem with this is that it exposes the Air Bombs to attack by Sneaky Archers and other troops. A successful air defense uses the Air Bombs and Firecrackers; at BH5, you need to be able to defend against 12 Baby Dragons or 32 Beta Minions; that's not going to happen if Air Bombs can easily be taken down.